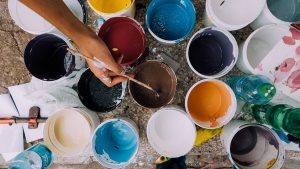 I want to wrap up this three-part series helping writers and creative types “come at” their imaginations and their creative practices in new ways, by touching on a big topic. 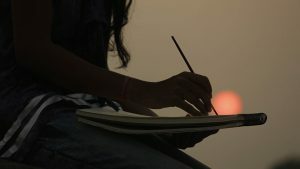 I began by sharing ways to engage the imagination in mindful flow to stay out of ruts, then an analysis of the parallels between meditation and revision. But in the end, why does art matter? Why now? This final installment looks at making our writings speak to the human predicament in impactful, meaningful ways. But voices of optimism have been growing all along. If you’re reading this, you’re likely one of them. I also hope that if you’re reading this, you care about continuing to cultivate your artistic garden and exploring what it means to be human, no matter where you fall on the political spectrum. Flash form writing has always been my favorite genre to teach online, because of its ability to so concisely speak to the human situation, while also requiring craft techniques on the page that demand our very best. I can think of no better time than right now to commit to achieving our “best.” Humanity needs it. Society needs it. Is it possible to change the world one story at a time? One painting at a time? I believe that it is. Will these small, individual efforts change politics? Will they make everyone happy? Will they be upsetting, disturbing? Will they provide challenge or provoke change? Maybe yes. Maybe no. But what’s certain is that fully engaging with your imagination and creativity will hone your observational skills as a creative person, which can only mean living a more engaged and uplifted life. Yes, that manifests on the page, but it also manifests at the grocery store, at the post office, and when speaking to loved ones. 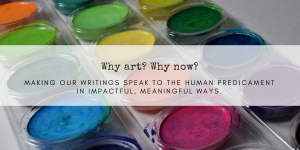 So why art, why now? I answer that question by turning it on its head. Why not art? Why not always? We’re all angling toward the same (Great Eastern) Sun, and there are infinite ways to get there. Each tiny step adds up. Word by word, brush stroke by brush stroke, hope and purpose can indeed manifest.